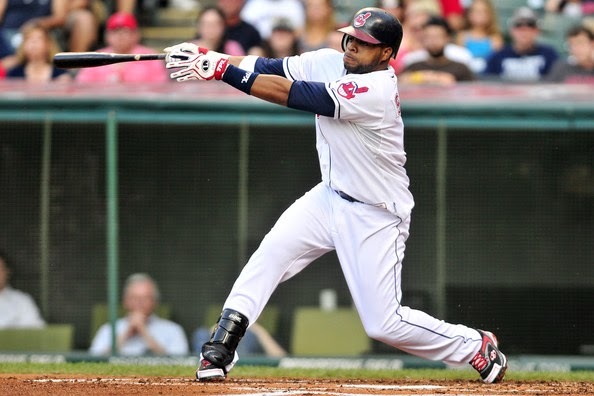 Here's hoping Carlos Santana and the Tribe can make things interesting. It's been a rather weird baseball season thus far. The game's twin giants, the Red Sox and Yankees, are among the lowest scoring teams in the league. The Texas Rangers, a popular pick to win the American League pennant, have the worst record in all of baseball. On the positive side of the ledger, the Baltimore Orioles have surprised everyone all year, building a commanding 7-game lead in the AL East with nobody mounting much of a threat to knock them off their perch. They've bewildered analysts by succeeding despite a subpar pitching rotation and limited contributions from key players like Matt Wieters (elbow injury, out for the year), Manny Machado (knee injury, done for the year), and Chris Davis (healthy but batting .194 following his breakout year in 2013). Their formula has been defense, homeruns, and a strong bullpen. With all the other AL East contenders faltering, that's been enough for them build up a big lead. The Oakland A's were the most dominant team in the game for much of the year but they've experienced a sudden rapid descent in the past month after executing a daring trade that sent one of their most imposing hitters, Yoenis Cespedes, to the Red Sox for pitching ace Jon Lester. The A's were leading the AL West division for most of the season, but they're now looking up at the Angels and a possibly insurmountable 4.5-game deficit. Alas, the Wild Card safety net virtually assures they'll be playing October. In the Midwest, Detroit and Milwaukee have also both relinquished division leads they'd been holding onto for much of the year. The Tigers have played below expectations as they often tend to. A blockbuster trade for David Price merely patched some holes in their rotation where Anibal Sanchez is hurt and Justin Verlander ineffective. Detroit hasn't fallen into any prolonged funk though, they were simply overtaken by a surging Royals team who are, like the Orioles, succeeding despite major flaws. Kansas City's offense is among the worst in the American League. Their success has been predicated on the league's best defense and a shutdown bullpen. The Brew Crew got off to a great start, hung around atop the NL Central while their rivals struggled to figure things out, and now have gone 22-30 since the beginning of July. The wheels appear to be falling off for them as they've now lost 8 games in a row and their best player Carlos Gomez is out with a wrist injury. Neither league looks to have much of a thrilling playoff chase in the works as the contenders are pretty clear. In the NL, the Nats, Cardinals, Dodgers, and Giants are virtual locks for the postseason with the Braves, Brewers, and Pirates fighting for the final wild card spot. In the AL it's the Orioles, Angels, and A's with the Royals, Tigers, and Mariners fighting for the other 2 spots. The Yankees are also technically in the mix but I have zero faith in them to stay there. There's one other AL team on the outside looking in that I find highly intriguing though, and that's the Cleveland Indians. Given that so much of the postseason picture is already clear, a true baseball fan can't help but root for whatever sliver of potential chaos remains. This is what my old colleague Jay Jaffe refers to as rooting for Team Entropy. Ideally, the Indians can muck things up for the Tigers and Royals while hopefully leading to a tie-breaker play-in game or two. Baseball Prospectus' current playoff odds give the Tribe just a 12.4% chance of making the playoffs but they've played very well of late and are actually pretty stacked with talent. In fact, they've gone 61-49 since May 1st. While hovering around the .500 mark in July they decided to trade away two key veterans in starting pitcher Justin Masterson and shortstop Asdrubal Cabrera. These bold moves were actually addition by subtraction---Masterson was having a career worst season in the final year of his contract and Cabrera was also in the last year of a contract and blocking one of the game's top prospects, Francisco Lindor, ready to take over at shortstop. To some it may have appeared the Indians were raising the white flag with those trades, but instead they've played their best baseball since then. They went 18-9 in August led by a dominant pitching staff that allowed fewer runs than any other AL team for the month. Long considered a weakness for this team, the pitching rotation is finally shaping into a respectable unit, led by righthander Corey Kluber who's emerged as one of the best starting pitchers in the game. Former Phillies prospect Carlos Carrasco has figured something out in his age 27 season, adding a few ticks on his fastball to give him a high-90s heater to go along with good control and lots of groundballs. If he maintains this, he's a potential star. Two other highly regarded young starters, 23-year-old Trevor Bauer and 24-year-old Danny Salazar are striking out hitters in bunches and if they can follow in the footsteps of Carrasco and refine their approach, the Indians quite possibly could boast one of the league's better rotations. Who saw that coming? The Indians' lineup hasn't lost a step since sending Cabrera packing. It's a deep group led by burgeoning star Michael Brantley who has broken out as one of the best hitters in the league at the age of 27. Carlos Santana has long been a favorite of mine, a switch-hitting catcher with power and walks, but he got off to a terrible start at the plate, hitting .159 with a .628 OPS through the first 2 months of the season. His struggles were most likely due to the stress of having to learn a new position as the organization experimented with using him at third base to give Yan Gomes, a better defender with plenty of pop in his bat, the full-time gig behind the plate. Once the Tribe realized the error in their ways and shifted Santana back to first base/designated hitter, his performance sky-rocketed. Since June 1st he's been his normal slugging self, hitting .274/.391/.520 with plenty of walks and power. Second baseman Jason Kipnis became an All Star last season with 17 homers and 30 steals but he's struggled badly this year, hitting .247 with just 6 homers. Third baseman Lonnie Chisenhall was among the top prospects in baseball for a while but had failed to produce in the majors until breaking out this year. Through the first three months of the season he hit .345 with power, but that performance was largely fueled by an unsustainable .389 average on balls in play. He's fallen back to earth, hitting just .237 since July 1st. Speedy leadoff man Michael Bourn has missed chunks of time with a hamstring injury but is now back in the lineup at full strength. A healthy Bourn and positive contributions from Chisenhall and Kipnis supplementing Santana and Brantley in the lineup could certainly be enough to make Cleveland a force in the Wild Card race. They currently sit 4 games back of Detroit for the second Wild Card, with the same record as the Yankees and 3.5 games behind the Mariners. While it's impressive that the Yankees are even mentioned here since they've suffered key injuries to players like Masahiro Tanaka and CC Sabathia, I find it hard to take them seriously as a contender. They cobbled together a revamped roster midseason through trades and have managed to stay afloat, hovering around .500 despite a negative run differential, but they ought to start sinking any minute now. The Mariners have had a great season, similar to the Royals in that their offense is horrendous but they get by with elite pitching and defense. They provide an interesting contrast to the Indians who have quite possibly the worst defense in all of baseball. The Indians have a reputation as one of the smarter teams in the game and yet they've bucked the stats-savvy trend of building strong defensive teams. That makes them even more intriguing to me because they're slightly weird. With 4 games left against the Tigers, they have the opportunity to win their way into the mix. That said, trying to handicap a month's worth of baseball is essentially pointless. I can eye each team's schedule and tell you that the Mariners appear to have an easier last four weeks than the Yankees or Indians. But really, unless the Royals or Tigers go in the tank, they are very likely to take the final two playoff spots. The most likely outcome is pretty boring. The same five teams that are lined up to be in the playoffs right now will be the ones who enter the playoffs. As someone who wants as much craziness, excitement, chaos, and entropy as possible to take place this September, I'll be rooting for the Indians. As was pointed out to me on Twitter, I neglected to make any mention of the Blue Jays even though they sit just 4.5 games out of the Wild Card (the Indians lost to the Tigers last night, falling to 5 games back). I must have overlooked them because I was tunnel visioning Cleveland and the teams they needed to jump over to grab the Wild Card spot. Having just won five in a row, the Blue Jays are certainly lingering on the fringes of the playoff frame as well. Upcoming 4-games series against both the Yankees and Mariners offer ample opportunity to create chaos. Overall it's hard to pin down the Jays, they've had an extremely up-and-down season with peaks and valleys that would make a seasoned roller coaster rider nauseous. Look at their winning percentages for the first 5 months of the season: .462, .700, .444, .577, .346. They've been without key hitters like Adam Lind, Brett Lawrie, and Edwin Encarnacion for extended stretches and this team is entirely dependent upon its offense to win. As has been true for years, the Blue Jays live and die by the dinger. Baseball Prospectus tracks a stat they call the Guillen Number which is the percentage of runs scored via the home run, and the Jays rank third in all of baseball in this regard. Encarnacion and Jose Bautista lead this charge with 29 homers apiece and if there was a stat that tracked the loudest struck balls, they'd surely be up there. * Beyond those two, they've got five players with at least 10 long balls and if Adam Lind (.465 slugging percentage) hadn't missed so much time he'd make it six. Unfortunately for Toronto, other than loud majestic moonshots from the lineup, this team doesn't offer much else. Atop the rotation are R.A. Dickey and Mark Buehrle, two inconsistent soft tossers, along with diminutive rookie Marcus Stroman who's got lethal stuff but has struggled to harness it at times and might be running out of gas with a 5.74 ERA since August 1st. The bullpen is a definite weakness and they're not a great fielding team either. Therefore, to really make things interesting in the final month the Jays will need to simply mash their way up the standings. I always consider Joey Bats' bombs and Edwin's parrot trots to be must-see highlights so I certainly wouldn't mind watching the Jays make a run. *This duo is impressive in that not only do they swing from the heels and smash home runs, neither of them strike out at an above average rate. Among the top 30 power hitters in the game (ranked by Isolated Power), only Victor Martinez sports a lower strikeout rate.